The supply of brand new apartments released for sale across Japan in 2016 reached the lowest level seen since 1992. 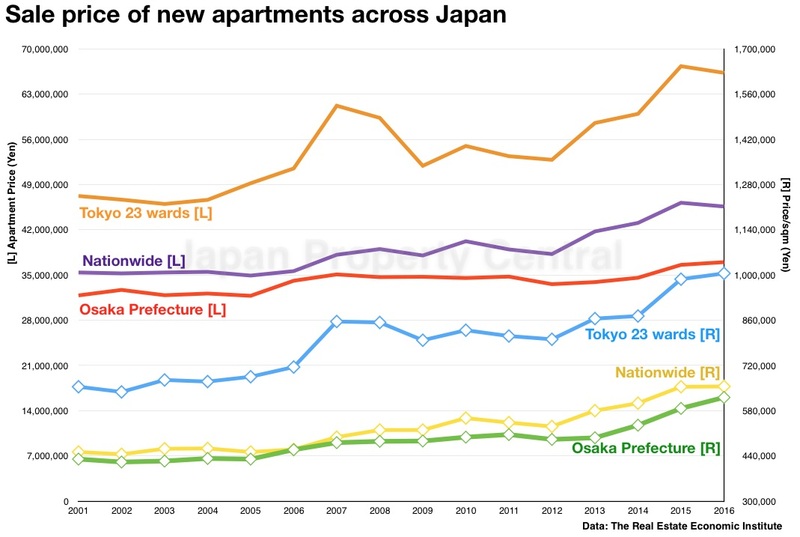 Transactions of second-hand apartments, however, reached a record high with sales up 6.9% in greater Tokyo and the highest level seen since record-keeping began. According to the Real Estate Economic Institute, a total of 76,993 new apartments were released for sale across the country, down 1.4% from 2015. This was the 3rd year in a row to see a year-on-year decline in supply. 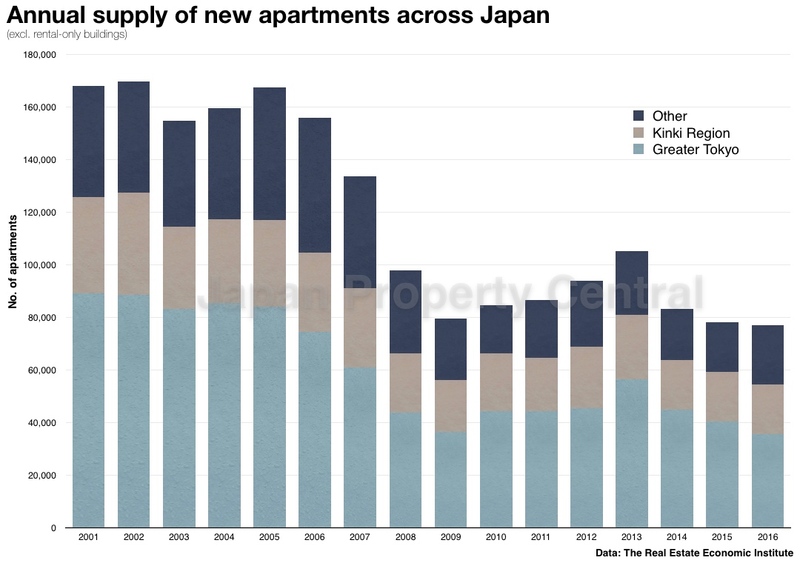 Almost half of the new apartments were located in the greater Tokyo area, which saw 35,772 apartments offered for sale in 2016, down 11.6% from 2015. Meanwhile, 37,189 second-hand apartments were reported to have sold in 2016, exceeding the number of new apartments. This number is potentially much higher since second-hand sale transactions are only voluntarily reported. In the Tokyo metropolitan area, 18,833 new apartments were offered for sale, down 21.2% from 2015. Supply levels in the Kinki region were down 1.3%, and down 2.6% in the Tokai/Nagoya region. The supply in the Tohoku region, however, increased by 65.2% from 2015 to 2,082 apartments. 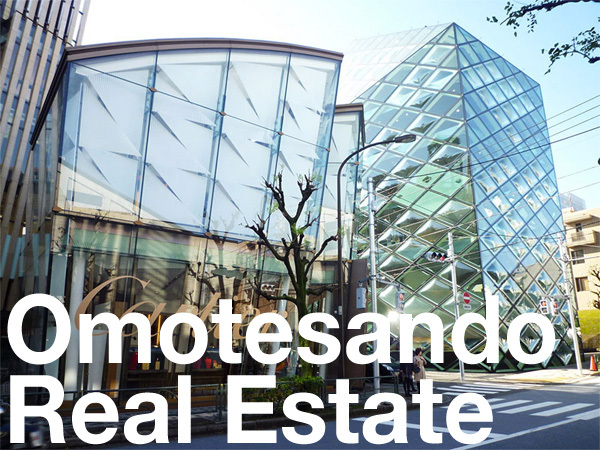 The Chugoku region saw an increase of 64.2% to 3,211 apartments. In Hiroshima City, the supply of new apartments was up 129.8% in 2016. The average price of a new apartment nationwide was 45,600,000 Yen in 2016, down 1.3% from 2015. This was the first time in 4 years to see a year-on-year decline, and has been attributed to the increase in the share of supply in regional areas where prices are generally cheaper. The average price per square meter was 655,000 Yen, up 1.5% from 2015. This is the fourth year in a row to see a year-on-year increase. The average price in the Tokyo 23 wards was 66,290,000 Yen, down 1.5% from 2015. 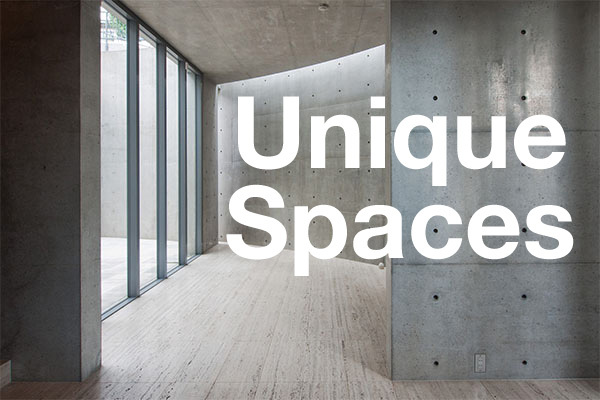 The average price per square meter was 1,005,000 Yen, up 1.8% from 2015. The total sales volume in 2016 was estimated at 3.51 trillion Yen (approx. 3.5 billion USD), down 2.6% from 2015 and half of the volume recorded in 2000. A total of 78,500 new apartments are expected to be released for sale in 2017, up 2.0% from 2016. 38,000 new apartments are expected in the greater Tokyo area, up 6.2% from 2016. Source: The Real Estate Economic Institute, February 20, 2017.